Each year Steamcon draws several thousand fans to its Steampunk convention, one of the longest running in the world. This year’s theme is “Victorian Monsters,” a weekend long Halloween party featuring all the classic monsters of the Victorian era. Frankenstein’s Monster, Dracula, Dr. Jekyll and Mr. Hyde, Spring Heeled Jack, the Invisible Man, Jack the Ripper and many more were born in the foggy streets of Victorian London. With participants dressing as monsters and monster-hunters, this year’s event is the perfect setting for Steampunk intrigue, ghoulish frights and ghastly delights. Kim Newman, the man who penned the thrilling alternate history tale Anno Dracula, will be the Author Guest of Honor. Joe Benitez, illustrator and creator of the gorgeous comic book Lady Mechanika is this year’s Artist Guest of Honor. The Monster Hunters of Honor will be the ever popular and outrageous League of S.T.E.A.M. Headlining the Saturday Night Concert will be Musical Guests of Honor the cello ensemble Rasputina. The concert will also feature a performance by the fabulous Nathaniel Johnstone Band and the theatrical Eric Stern of Vagabond Opera. 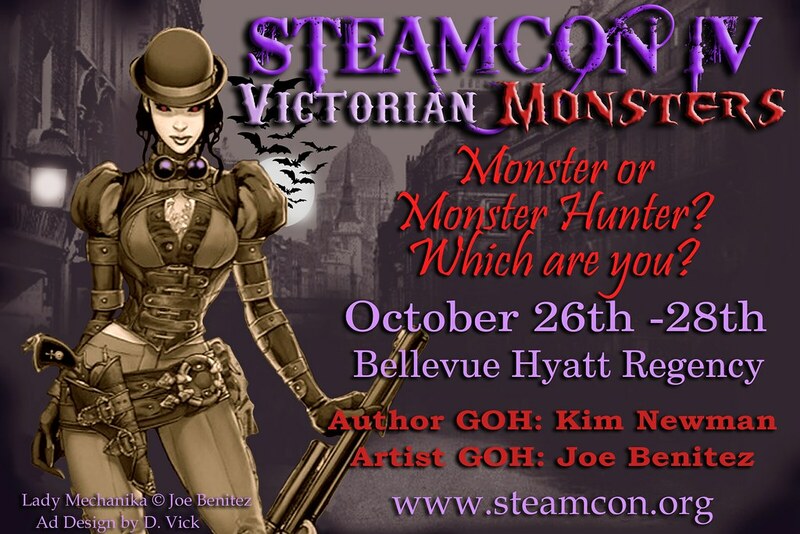 Taking place indoors at the lovely Hyatt Regency hotel in Bellevue on October 26th -28th, Steamcon IV will feature three days of lively panel discussions, demonstrations, and talks about the literary genre/music genre/fashion/do-it-yourselfers dream that is Steampunk. The Convention will host an art exhibition, a huge merchant’s room, several games rooms, a high tea, dances, a concert and much, much more. Speakers, fans and Steampunk aficionados from around the world will attend this international renowned event. Friday night will be the third annual Airship Awards Banquet, an evening to honor the most outstanding creators in the steampunk community. On Saturday there will be the Sanatorium Tea featuring a best monster costume competition, and on Sunday there will be the “Wayfarer’s Brunch,” an event to honor multiculturalism in steampunk. For more information, go to www.steamcon.org or drop us an email at info@steamcon.org.